In 2010, after years of planning, Harrison Street Park was planted with an ambitious array of native trees, shrubs and flower beds. 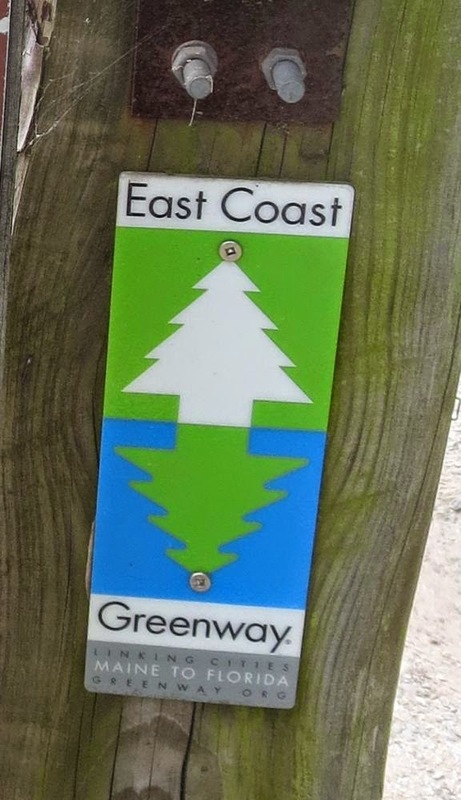 The goal was admirable enough: Beautify a park that had until then been largely a static assembly of trees and grass, with little habitat and ornament. I was involved in the early stages, providing a detailed ecological assessment and stewardship plan. Princeton arborist Bob Wells contributed a tree survey pro bono. After this input of local knowledge, an outside consulting design firm based in Philadelphia, was brought in to develop plans for plantings and play equipment, with ongoing input from neighbors. When the planting was finally done, there followed with uncanny timing a deep drought. Neighbors, having committed to caring for the plantings, put in long hours through the summer. Most of the plantings survived that first, heroic year, but then volunteer energy began to dwindle. A couple very active neighbors moved away. Borough maintenance staff couldn't take up the slack because they weren't trained to care for anything other than trees and turf. A professional weeding in 2013 salvaged some flower beds, though many of the planted species had by then been lost. And yet, in 2014, with most of the beds a weedy tangle, two of them are flourishing. This raingarden at the edge of the field is weed-free and filled with flowers. And this planting next to the bridge dedicated to borough engineer Chris Budzinski still looks good. Why are they prospering while other plantings have been taken over by Canada thistle, mugwort and other aggressive weeds? The answer lies not in how much money was spent, or the beauty of a design meticulously laid out on paper. In fact, the best results were attained without cost or elaborate planning. Instead, success grew out of on-the-ground experience and long observation of how rainwater flows in the park. That flow, whether natural or manipulated to advantage, determined which gardens survived and which ones burned out volunteers by growing abundant weeds. and look downhill towards where all the storm runoff from the asphalt flows into the park. This water is so important that, when they repaved the lot a year or two ago, I checked to make sure they didn't add curb and gutter to divert the water into a storm drain. Why? Because just beyond the fence is a raingarden that I and other neighbors helped Clifford Zink to plant. In the park's large expanse of grass, the garden (back right) was planted not just anywhere, but strategically located in a sunny swale that receives the runoff from the parking lot. The periodic infusion of water creates an underground reservoir of moisture. 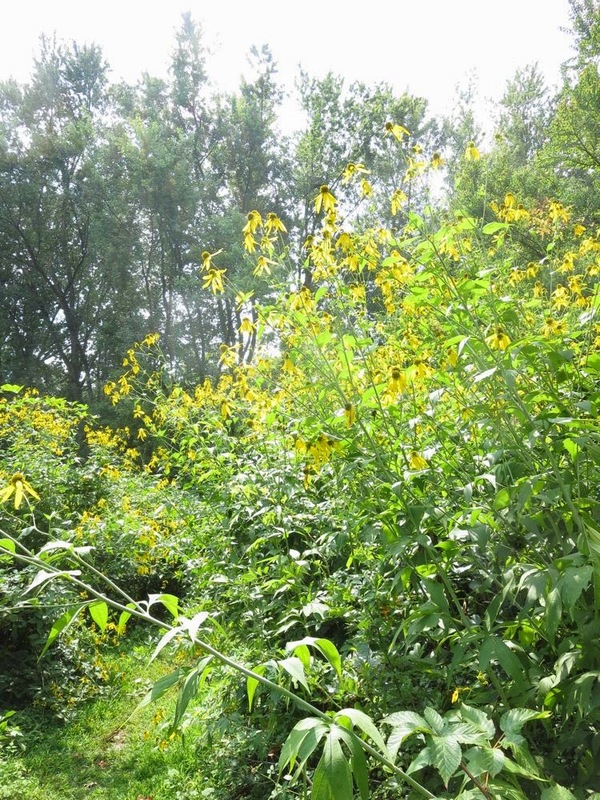 Powered by adequate sunlight and fed by the stable water supply, the native plants prosper. What few weeds manage to survive the competition can be easily pulled from the soft ground. 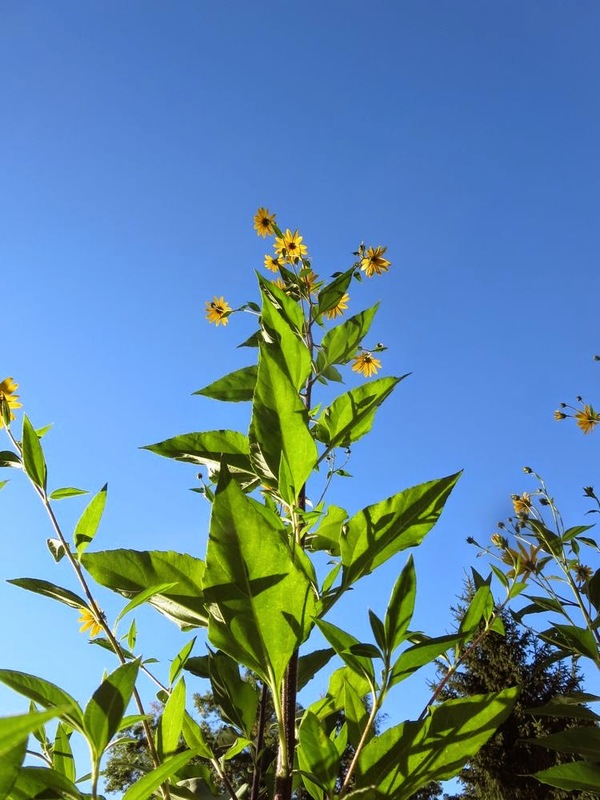 Now, it might have been better if we hadn't planted sunflower species that spread underground and have been steadily displacing the less aggressive swamp milkweed, hibiscus and even joe-pye-weed. But the result is still attractive and very easy to maintain. A well-timed hour or two with a few volunteers pulling out some of the sunflower stems next spring would restore balance. It's worth noting that this successful garden, planted by volunteers at no cost to the borough, was actually slated to be removed by the landscape design firm, which failed to understand its logic and value. Neighbors had to rally to make sure it was not removed. Of the garden beds added by the design firm, only one has proven relatively easy to maintain, due to it also having been planted in a swale, where wet, sunny conditions favor the natives and make weeding easier. This shadier planting might have done well with consistent care, but long periods of neglect allowed garlic mustard and Canada thistle to take hold. Apparently worked on this year by parks staff led by someone knowledgeable about plants, it still contained enough of the original foamflower and ironweed to be attractive. There were other locations in the park with the combination of wet and sunny conditions that favor native wildflower plantings, but these spots were instead planted with trees that cut off sunlight, or raised up in a way that shunned the periodic infusions of runoff that could have keyed their survival. The flower bed in this photo, shaded and raised up on a berm, must have looked good on paper and when freshly planted, but offered none of the sun and natural water needed for the natives to compete with weeds. These berms, hazardous to mow, can't even revert to lawn as most failed gardens do. So, what's the verdict on Harrison Street Park's grand experiment in planting and caring for naturalistic flower beds? Study the way water flows in the park and choose your spots wisely. A poorly situated garden that favors weeds over intended plants will burn out volunteers. Rather than plant traditional perennial borders that tend to be elevated and attract weeds, focus on areas that are in swales or depressions, and receive enough runoff and sunlight to power native floodplain species robust enough to outcompete unwanted plants. Start small and expand incrementally, making sure that the maintenance work doesn't outstrip volunteer interest. Particularly in a place like Princeton, use local talent that feels invested in the park. If a design firm is needed, favor one that understands how water drives landscape decisions, and has had as much experience maintaining flower beds as designing them. If town maintenance crews are used, have them supervised by someone trained in plant identification. This photo captures what has worked well in the park: two rain gardens and the sports field intentionally given a slight crest to shed water. These successes, whether designed to receive runoff or shed it, depended on close attention to "where the water goes." In the backyard, the exuberant yellows and brilliant whites of August are mellowing into a more subtle color scheme. The stonecrop, which I'd like to induct into the nativy non-native club, is deepening towards burgundy. September's late boneset (Eupatorium serotinum) is gracefully extending the white of August's boneset (Eupatorium perfoliatum), though to a much reduced audience of insects. their cheer is muted by the deepening browns of Joe Pye Weed. Today was as good a time as any to take a measure of this magnificent summer's growth. Cutleaf coneflowers rose to 6.5 feet. The JoePyeWeed topped out at 8.5 feet. 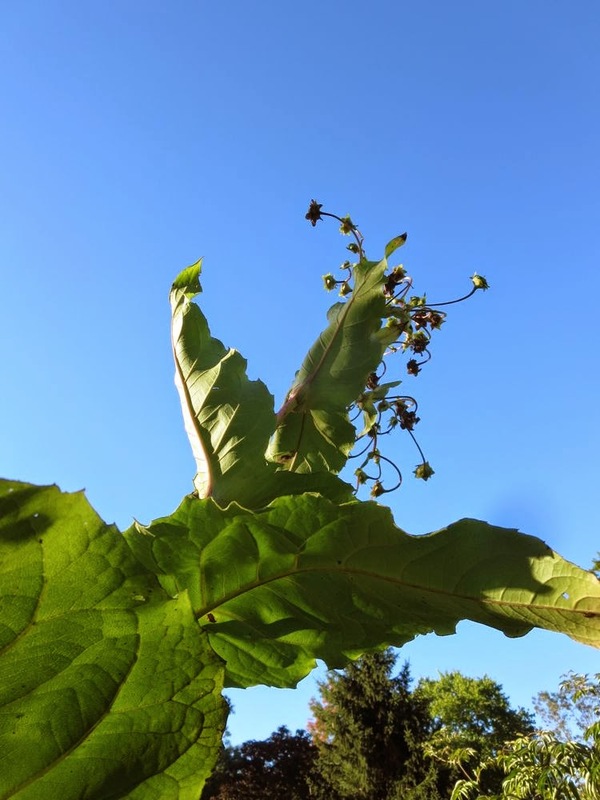 The cup-plant in this photo rose ambitiously to 9.5 feet before growing top-heavy and splaying out. Sunchoke was the undisputed champ, rising to 10.5 feet, even though it was growing in pots. The big pots, which contain the sunchoke roots' imperialistic tendencies, can be tipped over in the winter to harvest the edible tubers packed inside them. I eat them raw, but a friend heaped praise upon sunchoke soup. 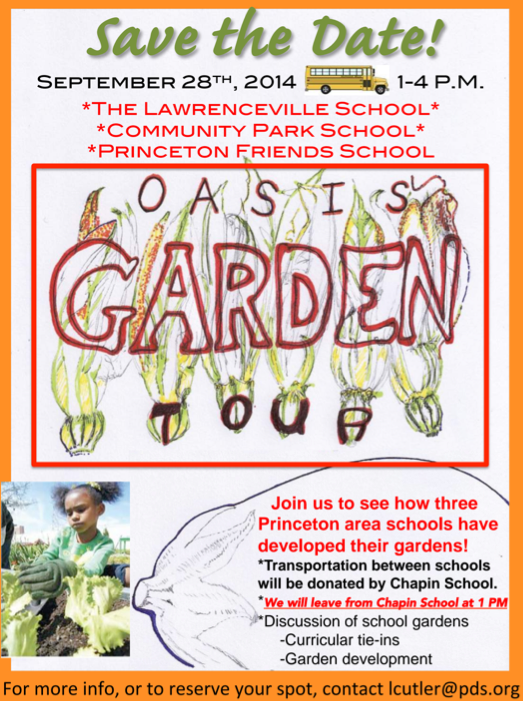 Here's an opportunity to visit some of the great school gardens in the Princeton area. Info below's from Liz Cutler of Princeton Day School. OASIS stands for Organizing Action on Sustainability in Schools. Reserve your spot now for this Sunday's OASIS School Garden Tour. We will visit the school gardens at Princeton Friends School, Community Park School in Princeton, and the Lawrenceville School Farm program, touring the gardens and hearing from the garden coordinators about curriculum integration. Meet at Chapin School on Princeton Pike by 12:55 in time for a 1pm departure by bus (donated by Chapin School). You must reserve a spot on the bus. The tour is free. We will return to Chapin School at 4:10pm. These are two very brief videos that show how two different kinds of bees--a bumble bee and another kind much smaller--get food from a richweed flower in completely different ways. The bumblebee goes for the nectar, while the small bee in the second video climbs out on the long filament to get to the pollen-bearing anther, ignoring the rest of the flower. "Bumblebees look perfectly matched for this flower, bobbing from one to another, giving each one a bear hug as they sip the nectar. The flower is so shaped, with the stamens jutting out on either side of the flower, to appear as if the embrace is mutual." The first video I took while talking to a friend next to our front yard raingarden. Then along comes another kind of bee that relates to the flower in a completely different way. If it's early September, it must be time to write about what I did with my summer. In August, I traveled once again to the land called Boneset. What I saw there will open the minds of anyone who thinks flowers are only visited by honey bees and butterflies. In the land of Boneset, which happens to be at a perfect height for photographing, miniature acres of tiny white flowers attract all sorts of wonderfully strange creatures whose names are on the tips of very few tongues. Some six-legged visitors are interested in what the flowers have to offer. Others, often with eight legs, lay in wait, using the flowers as bait to attract their next meal. Some linger for days, others patrol without landing. Others are said to leave their scents, then check back later to see if the scent has attracted a potential mate. Some arrive in sufficient numbers to look like herds of insects grazing in a field of brilliant white. Others multi-task by continuing to feed on the nectar while they mate. Here is the first wave of photos from my travels. Say the magic words, "Eupatorium perfoliatum", plant one or many in your backyard, and you too can travel to this unsuspected world. #2) and the inchworm mentioned in a previous post that includes what some might call a spellbinding video of it doing its inchworm walk. 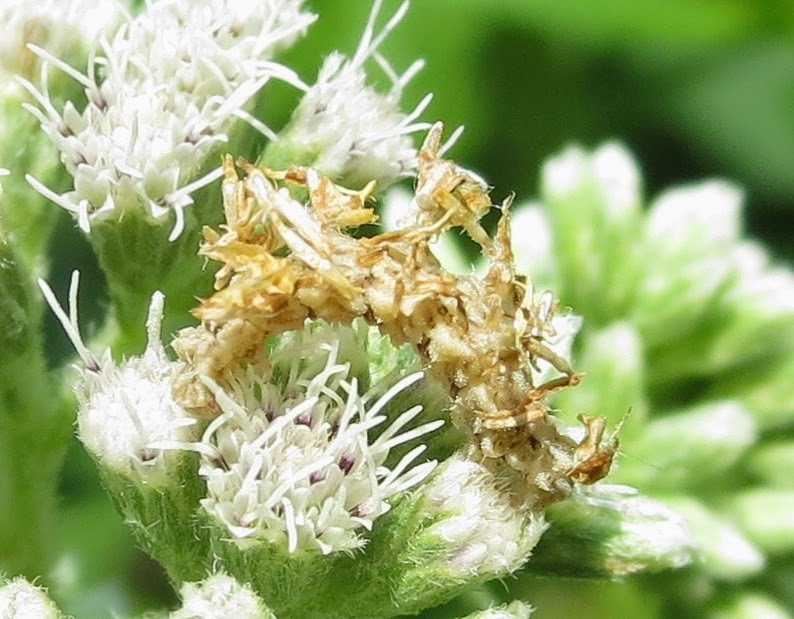 #2a) Is this the same inchworm (camouflaged looper), but tinier and wearing a slightly different camouflage? I'm glad you asked because I have absolutely no idea. I can tell by the markings, however, that the forefinger in the background is definitely mine. #3) And this chunky fellow wearing orange and black. What year's Princeton alumni coat is that? Class of 2 million B.C., perhaps. Okay, I really should be giving these insects their real names. All in the fullness of time. Many likely don't have decent common names. We'll need to have a contest. #4) Nice cape, or are those tails? 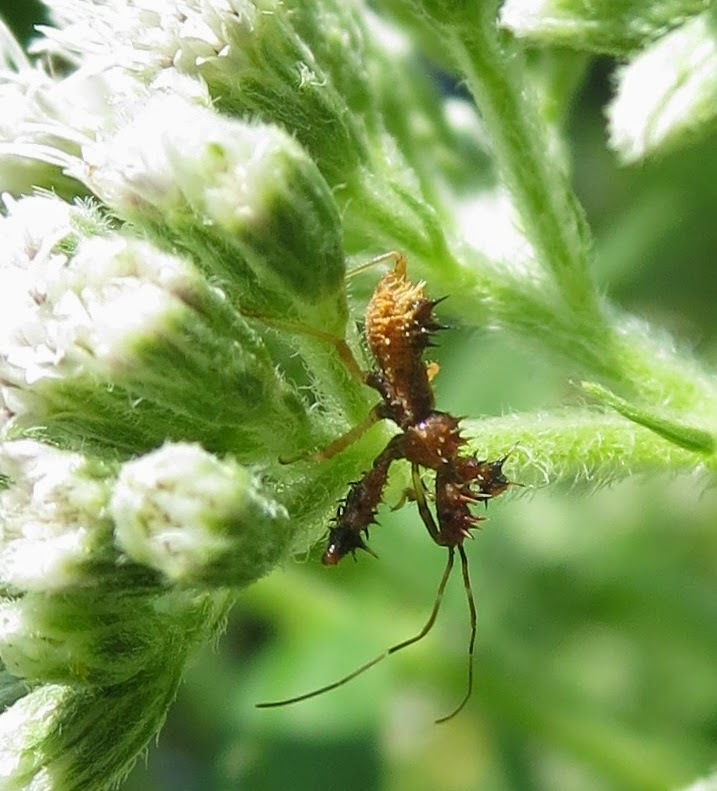 #5) These bugs ("bug" in entomology actually refers to a kind of bug, an order of insects called the true bugs--I know that much), from the frequency of their appearance and the frequency of their coupling up, appear to consider boneset their home as well as their lunchstop. #6) This one looks a lot like the previous one, but it's skinnier and appears to have swollen, clawlike legs in front. #7) Finally, something familiar: A honey bee, which is what most people associate with flowers. And wouldn't you know it? That's the one that happens not to be native to America. #8) For these nondescript black bees, my classification for the time being is small, smaller, tiny, and miniscule. The slogan for this blog post is "Miniscule is cool." #9) The pattern of stripes on the abdomen has GOT to be a clue. #10, 11) This photo and the next may be of the same kind of black wasp, but the first one looks hairier on the thorax. #12) Here's a sweat bee, which rhymes with Halictidae. With a name like that, it must be attracted to sweat, or at least the salt in the sweat. Does boneset sweat? It sweats nectar. 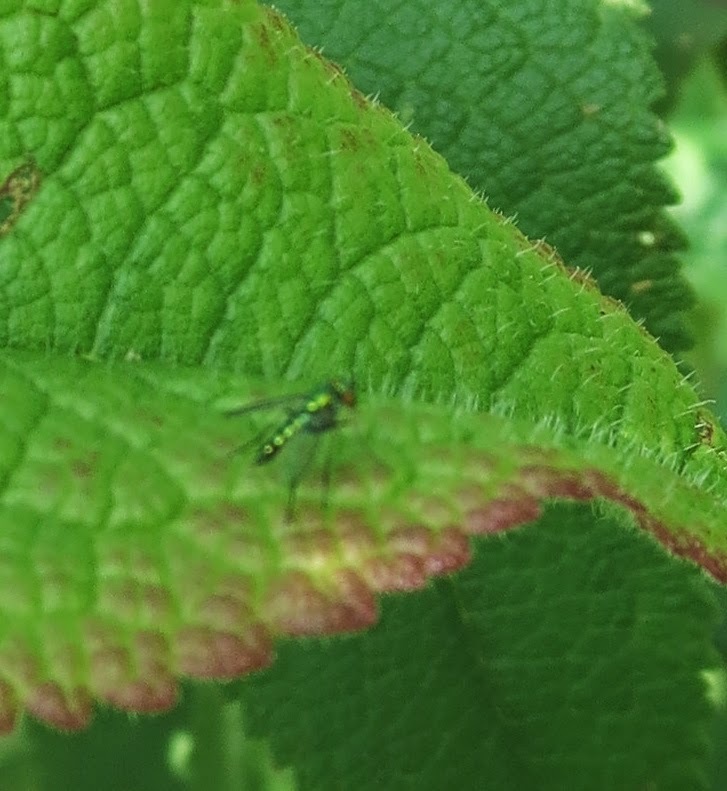 #13) This might be another kind of sweat bee. How much sweat could a boneset sweat if a boneset could sweat sweat? #15) This one has such a "tinier than thou" air about it. #16) There, down in the lower left, something brown that looks like a fly, but its wings stick straight out to the sides. #17) This little fellow, oval and black, reminds me of a small, tank-like insect that was attracted to the salad when we ate dinner outside when I was a kid in Wisconsin. Maybe if we had planted more boneset, they would have stayed out of the salad. There you have it. I counted 17 that are plausibly different species. And that's just on a sunny afternoon on August 7, with the boneset just starting to open up in a backyard behind a house on a busy street in Princeton, NJ. This "What I did with my summer" essay is starting to look like the first chapter of Boneset Days, or the soap opera As the Boneset Blooms, with a cast of characters that may grow to rival a Russian novel. through which towering cutleaf coneflower can still penetrate in places. Did I forget insights? Well, there's some human manipulation behind all of this nature and nature appreciation. The wildflowers are enabled by a state parks mowing crew that mows the university-owned field just upstream of Harrison Street once every year or two in the dormant season, and keeps the nature trail loop through the field clear. And then there's the missing insight, of how to keep the porcelainberry from eventually sweeping over that beautiful spot beneath scattered oaks where the JoePyeWeed, ironweed and goldenrod flourish. There's a bit of a shock awaiting anyone who takes the short trail from the Herrontown Woods parking lot down to the rock-lined stream. 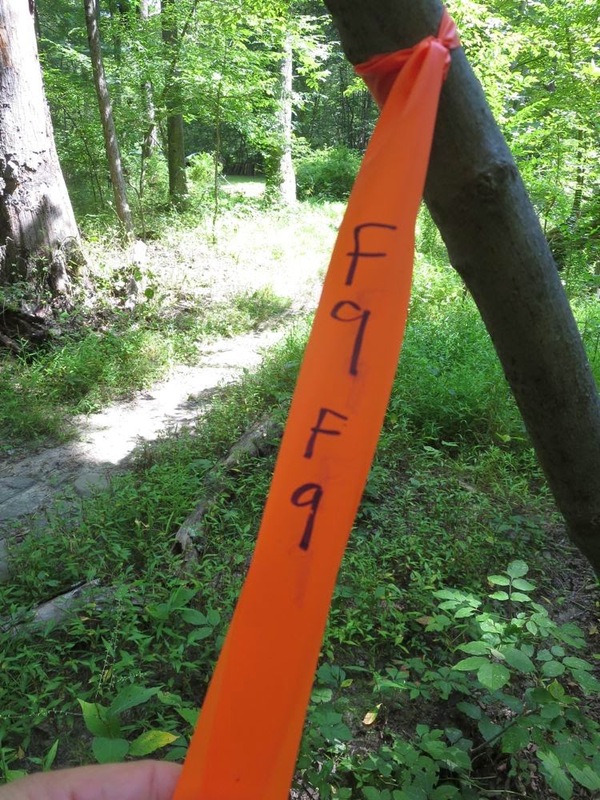 Ribbons of different colors are now wrapped around trees; survey stakes mark points with significance unknown. There's a strong feeling of invasion in a landscape thought to be safe from intrusion. Take a look at a map, however, and you see that what was assumed to be part of the park in fact is not. 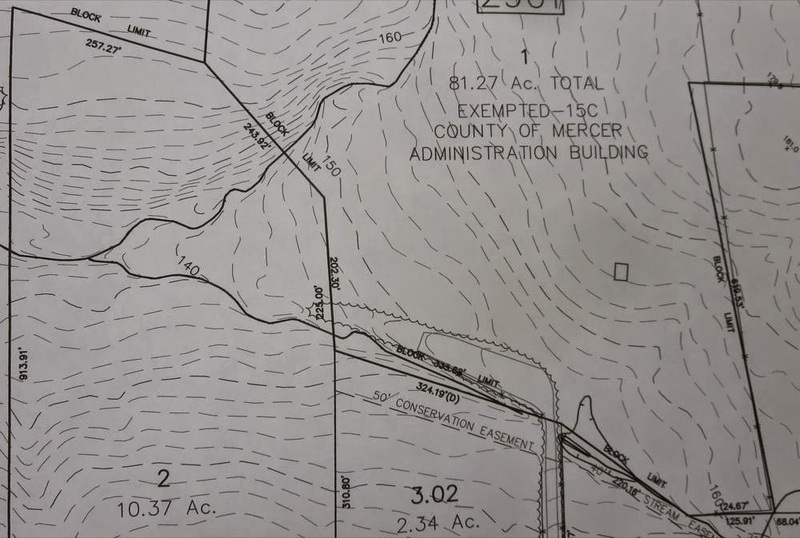 In the lower middle of the map is the parking lot, with a small portion of the driveway leading in at the bottom, to the right of "3.02". To the left, you can see that where the two streams meet is actually in a separate parcel. That long sleepy parcel of 10+ acres fronts on Snowden Lane across from Smoyer Park, and was recently purchased. Thus far, I've contacted town staff and the Friends of Princeton Open Space. Stream buffer requirements (probably 50 feet on either side) may protect the space between the streams from development. The steep slope (evidenced by the topo lines being crowded together) may limit development in the upper left. But all of this is speculative, and doesn't rule out the possibility that one of Herrontown Woods' prettiest and most peaceful stream crossings could be compromised by housing construction. Note: That trail, by the way, was blocked for a month or two by a fallen tree. Word got to volunteers Kurt Tazelaar and Sally Curtis, of Friends of Herrontown Woods, who spent a couple days clearing the blockage. If you like to "like", or want to read more about Herrontown Woods and the Friends group, check out the Friends' facebook page, and also various posts at VeblenHouse.org. Below are the various ribbons and stakes encountered.